If you've been paying attention to the structure of standard player contracts over the last few years, you're more than aware that there’s been a pretty substantial development into how players are being paid. 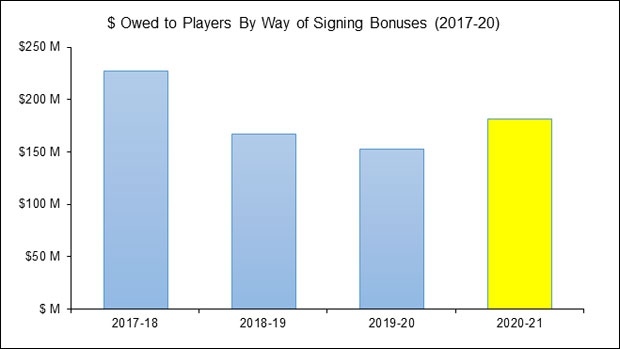 Players, agents and general managers have caught on quickly to the benefits of the 'signing bonus heavy' contract – a type of salary structure that allows the player to take the majority of his salary in the form of one cheque at the beginning of every year. While these players' cap hits will look the same regardless of how they receive payment, there are two very particular caveats to the signing bonus heavy contract. One, they’re what many consider 'buyout proof.' Buyouts are calculated by taking two-thirds of the remaining salary owed (which does not include signing bonuses), then spreading that number over twice the remaining contract length. Maple Leaf fans came to understand the pain that this can cause a front office under the David Clarkson contract, which was one of many deals laced with signing bonus money. Two - signing bonus money is guaranteed. And rest assured, that message has been put in the back of every player's mind by every agent worth his salt. 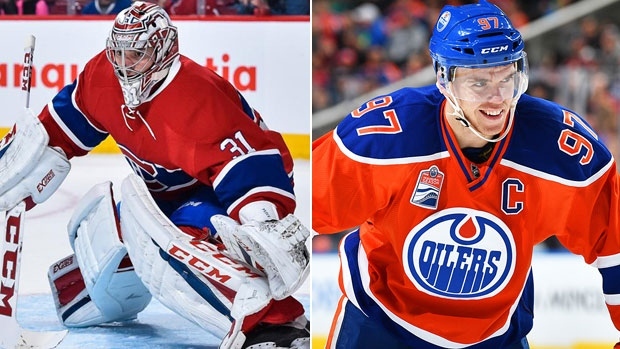 The NHL is set for another round of labour negotiations soon - perhaps sooner than many realize. September of 2019 is essentially a drop-dead date for both the NHL and NHL Players' Association, either of whom can 'opt out' of the current collective bargaining agreement. (And it will almost certainly happen as we're already listening to early grievances on, among other things, redefining 'hockey-related revenue'). And when it does happen, the clock will begin ticking on the life of the 2020-21 season. On that point: If you've been keeping a close eye to the timing of the payouts on these signing bonus heavy contracts, you know that the players and their agents have staggered payments in a very peculiar way. Specifically, they're taking a curiously high percentage of signing bonus money to begin the – wait for it! – 2020-21 season. I’m not sure if it's fair to say that this has gotten out of hand, but I'm guessing that the NHL didn’t envision about $750 million of contracts being paid out via signing bonus over a four-year window. But the above graph doesn’t unitize well. After all, we have over $2 billion in player salaries committed to for the 2017-18 season and thus the $227 million owed by way of signing bonuses is really about 11 per cent of total outlay. With each passing season, we have less players signed to contracts and thus less money guaranteed. So, how concerning is that $182 million number in 2020-21? Think of it like a percentage of money guaranteed. And when you think about it in that light, you realize just how quickly the players are ramping up for labour warfare. Now that's behavioral and that's strategy. That's a group of players - mostly top-tier and second-tier veteran players, mind you, who would surely have a stronger voice during negotiations - who are setting themselves up financially in the event that the league closes its doors. Even if that closure is temporary. And again, I come back to what the owners must be thinking. The biggest weapon the owners have during any work stoppage is the financial stranglehold they can put on the players. Here, before they even had a chance to lock out the players, they'd have to pay more than 25 per cent of salaries owed. And that's not insignificant. The scary thing here if you're an owner is, barring some sort of intervention or incredible cap squeeze, there’s no obvious recourse. 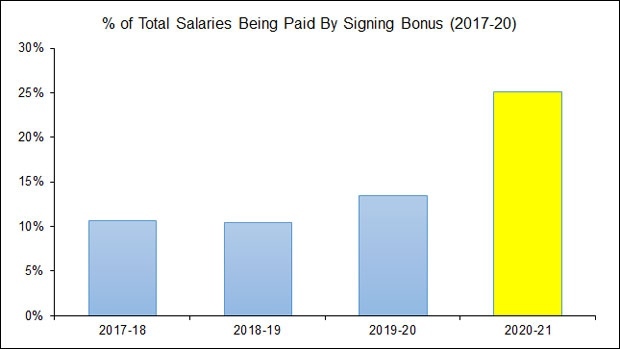 The number of signing bonus money owed in 2020-21 has nearly doubled from where it was just a season ago. If the next couple of off-seasons behave in a similar manner, just how much liability is the league looking at here? At the current rate of 25 per cent and assuming a three per cent growth rate on the NHL's hard cap, we could be comfortably looking at anywhere from $400 million to $500 million in signing bonuses liabilities – more than double what we are observing in 2017-18. With that kind of check, we could see the players union dig in like never before.